Pocket Boy And Pocket MD Play Actual NES And Mega Drive Carts, Not Just ROMs | OhGizmo! By Andrew Liszewski on 04/21/09 • Leave a comment! It’s a good time to be a retro gamer. Not only are there countless devices that can be used to play ROMs, but there’s now a couple that will accept NES and Sega Mega Drive (aka Sega Genesis) cartridges. 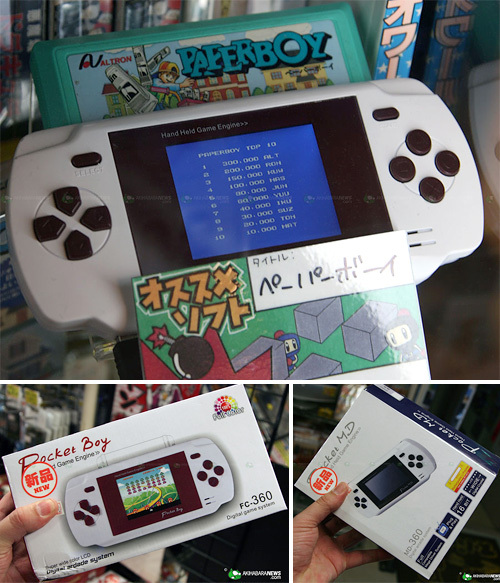 The Pocket Boy and Pocket MD both look suspiciously like the PSP, but the biggest difference is that each one has access to a library of games you’ll actually want to play. (Kidding, kidding!) They both feature a full-color LCD display as well as video-out functionality for enjoying your classic titles on a TV, and are currently available in Japan for about $40.